When coaching a client who knows their calling, there is still the question of how to walk it out. For some, following the call is like tiptoeing through a minefield. One false step and it’s over—they’ve missed their call. I call this the MapQuest Paradigm. It sees pursuing a call as following a list of turn-by-turn directions like you’d get off of MapQuest.com. If you haven’t used MapQuest yet, you go to the website, type in the starting point and the destination, and it gives you a complete list of each turn you need to make to get there. The thing I hate about MapQuest is, without an actual map, if you miss a turn you are totally lost. (That’s why I always print out the map, too.) A simple turn list doesn’t help you visualize the twists and turns of the road, or show which compass direction you should be heading toward, or give you any landmarks en route. It’s a sick feeling to figure out that you missed a turn somewhere 20 miles back (especially at night) and have no idea where you are or how to get back on course. That’s how many Christians operate. Each decision in life is a turn, and to get to the right destination, you have to follow the directions exactly and get every turn right. If at some point in life you have taken a major wrong turn (say, bankruptcy, divorce or coming to Christ later in life), your calling is lost. In the MapQuest paradigm, there is no way to get back on the highway once you miss a turn—the call has passed you by, and you’ve missed God. I’ve worked with several individuals who had a sense of call early in life, and for various reasons chose to go in another direction. When that fact resurfaces in their 40’s and 50’s, the question is, “What do I do? Have I completely missed my calling?” How do you coach someone who believes they have taken that big wrong turn? The answer is to switch paradigms. If you have an actual map you travel by instead of just a list of turns, you can find many ways to get to the same destination. 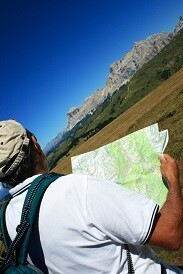 You can even make a wrong turn or change your mind along the way and re-plan your route based on your current location. There may be one way that is faster or more direct than the others, but the scenic route will get you there, too. I think the map image gives a more accurate picture of calling, because a map lets you base your route on principles (interstates are faster than county roads) rather than just blind adherence to a pre-determined plan. In other words, following your call is as much about knowing the ways of God (the principles) as it is knowing exactly where to be, when (the turns). The MapQuest paradigm is rooted in a worldview that says that life is a series of right and wrong choices—if you make the right ones you are blessed, and if you make the wrong ones, you lose. It’s a pre-Christ worldview: grace and redemption are not part of the picture. In the reality of God’s grace, there is always a future and a hope. No matter where you are starting from, today (and each day) God will take your life and make something great of it. When you are coaching this legalistic worldview, techniques that bring grace into the picture can be very helpful. For instance, you might ask, “Since Jesus was all about redeeming us from our failures, how does that principle fit with your understanding of following your call?” Another method (which I am stealing from Jesus) is to compare the situation with parenting. “If you gave your son a set of step-by-step directions for cleaning the garage, and he messed up a step, how would you handle it? Would you say, ‘That’s it—you are never going to amount to anything?’ Or would you correct him, do a reset, and have him start again?” Sometimes I’ll simply describe both the Map and MapQuest paradigms, and then ask which approach describes the way they are thinking.